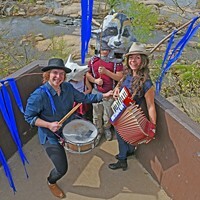 Fly on the Wall | Cover Story | Style Weekly - Richmond, VA local news, arts, and events. A visitor to the final Anderson Gallery installation examines a work by Lee Piechocki, a VCU painting and printmaking graduate student, whose additional works are shown nearby. The video and photography piece, foreground, is by graduate student Anthony Smith. Pack up the collection. Shut off the lights. Lock the doors. 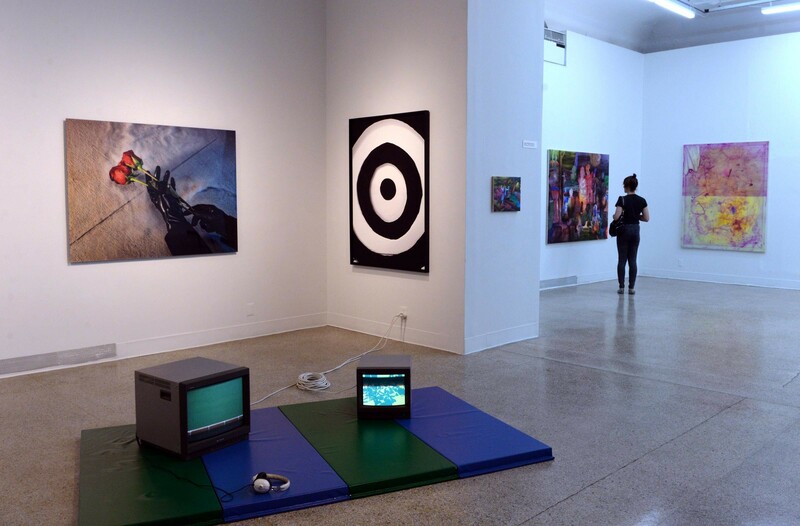 After 45 years, the Anderson Gallery at Virginia Commonwealth University is closing May 17. The happenings at the homely but endearing old pile at 901½ W. Franklin St. have added an invigorating and intellectually challenging anchor to the Richmond art scene. Hundreds of exhibitions were mounted on clinically white walls that featured a range of visual explorations — from old master prints and African textiles to Yoko Ono’s “Fly” installation. There were eye-popping and inspirational faculty retrospectives. 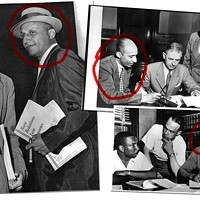 Generations of students offered up their work to that first glare of public scrutiny. Films were shot and screened there, brilliant lectures and gallery talks heard. For many years, in a conservation lab, students learned to preserve art objects. A modest-sized permanent collection was stored nearby. Openings, especially of student shows, often were giddy occasions of great expectations. Social events could be networking heaven, or near calamitous. During a fundraiser in 1983, one guest’s clothing went perilously up in flames — and it wasn’t performance art. Yoko Ono arrived at the Anderson in a limousine Oct. 18, 1996, for the opening of her “Fly” exhibition. 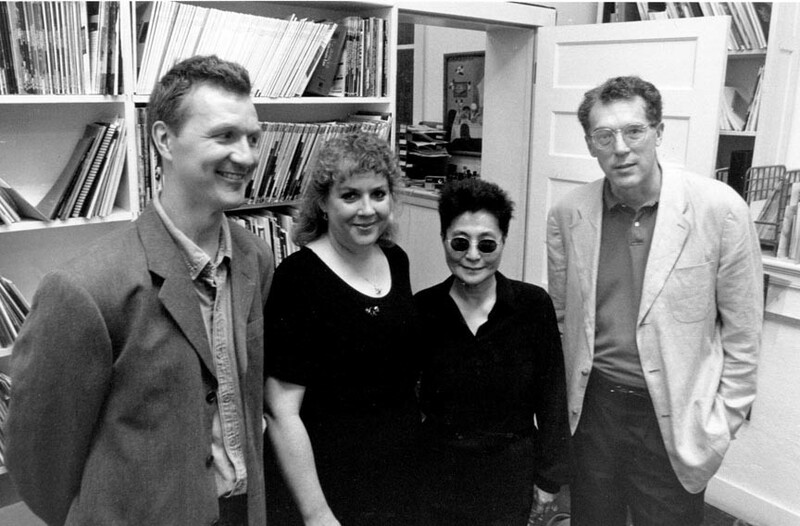 Attention paid to her by first-nighters all but eclipsed other artists whose shows also opened that night including, from left, Cliff Baldwin, Sue Johnson and David E. Thompson. Spanning five decades, the Anderson consistently delivered two things: the new and the unexpected — and often the remarkable and beautiful. And the building’s 5,000-square-foot exhibition space was always tough enough to withstand the most aggressive of installations. It’s rare for a still-vital, popular and state-supported cultural institution — that’s almost half a century old — to close. And the Anderson, under the stewardship of Ashley Kistler and a small but talented staff of professionals and student assistants, has never looked better or operated at a higher level programmatically. But to call the gallery’s on-campus location constricted and its physical facility limited is an understatement. Those factors, and the sometimes lukewarm institutional support for its programs, prevented the Anderson from ever figuring out what it wanted to be when it grew up. 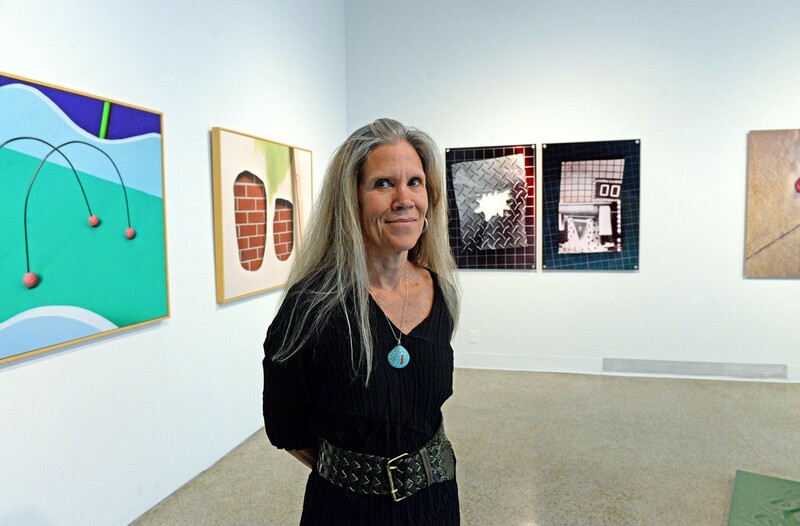 Ashley Kistler, the Anderson Gallery’s sixth and final director since it opened in 1970, stands amid the graduate thesis exhibition that closes May 17. She and gallery staff are preparing a book that will examine the institution’s more than 45-year history. What does the beginning of the end look like? It’s 7:30 p.m. on May 1, a First Friday. The gallery’s opening-night crowd for the second round of the annual graduate student shows thins out. Kistler, the sixth and soon to be last Anderson director stands in the gallery foyer fully aware that this is it — the last hurrah. She graciously greets visitors while casting her discerning, searchlight gaze across the jolly crowd. Patrons embrace, discuss summer plans or compare notes on what works registered positively with them, or maybe not. The pieces by the 20 emerging artists being shown till Sunday, May 17, occupy the first-, second- and fourth-floor galleries. They represent painting, printmaking, photography, film and theater programs — as well as department names that didn’t exist when the Anderson opened in 1970. Those include kinetic imaging, sculpture, extended media, and craft and material studies. With the Anderson shuttered, its collection will be housed in the university’s James Branch Cabell Library. But it’s unclear where graduate students will hold capstone shows in the next few years. Plans call for graduate exhibitions in the new Institute for Contemporary Art at Broad and Belvidere. But the construction of what promises to be an architecturally iconic complex has screeched to a halt — which sources blame on disputes about cost overruns, design changes and escalating expenses since the project was announced three years ago. 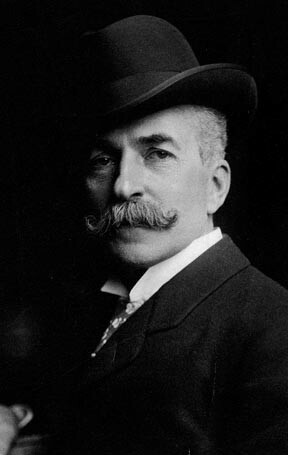 Abraham Archibald Anderson, (1847-1940), a wealthy and dapper New York businessman, painter and arts patron, contributed funds for the gallery’s construction in the early 1930s. When the Anderson opened in 1970 with a showing of student works, it was more accurately a reopening. The gallery initially opened in 1932 when Henry Hibbs, head of the fledgling School of Social Work and Public Health at the College of William and Mary, moved the tiny school into a former house at Franklin and Shafer streets. 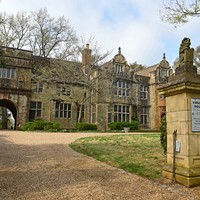 He selected the location because it was across the street from the Richmond Public Library, which occupied the former Lewis Ginter house at 901 W. Franklin St. When the library moved to a new building at Franklin and First streets, the school bought the handsome mansion. 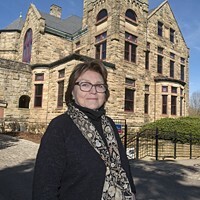 Hibbs, always a wizard at repurposing former domestic spaces for academic uses, pinpointed the well-built stable behind the Ginter house as ideal for showing art. At the time, Richmond had no art museum — the Virginia Museum of Fine Arts wasn’t established until 1935. When Hibbs heard that Abraham Archibald Anderson, a well-heeled artist and arts advocate was in town — he owned the 900-acre tract where Richmond’s regional airport was built — the dean buttonholed the New Yorker, convincing him to donate $10,000 to convert the stable into a gallery. The deal apparently was sealed when Hibbs invited Anderson to exhibit his own work as the inaugural show. An additional $24,000 was raised locally for the gallery’s construction. While the 50 paintings that Anderson exhibited in 1932 seem saccharine today, during the show’s first week some 1,200 art-thirsty Richmonders flocked up the cobblestone alley to the new gallery. Among them was John Garland Pollard, the first visit to the campus by a governor. When the growing school became Richmond Professional Institute in 1939, a larger library was required for accreditation. So the Anderson was converted for library use with a third story added and a fourth floor in 1947 that responded to enrollment growth as veterans returned from World War II. As Hibbs later wrote, “These numerous additions and alterations perhaps did not improve the exterior appearance of the old Ginter stables which had been attractive and well-designed.” Unfortunately, they also made the interior look like a rabbit warren. But after RPI and the Medical College of Virginia merged in 1968 to form VCU, the Anderson Gallery re-emerged. Two years later, with the Cabell Library built, the former gallery-turned-library reverted to its second use. Bruce Koplin, an art history professor, was named director. Job one was directing student gallery assistants in dismantling wooden bookshelves that filled every floor. When the gallery opened in November 1970, a full-length portrait of Anderson, cigarette in hand, greeted visitors in the foyer. And Hibbs, then retired, made periodic trips to the gallery’s third floor to examine the European and American prints he donated decades before to form the core of the permanent collection. 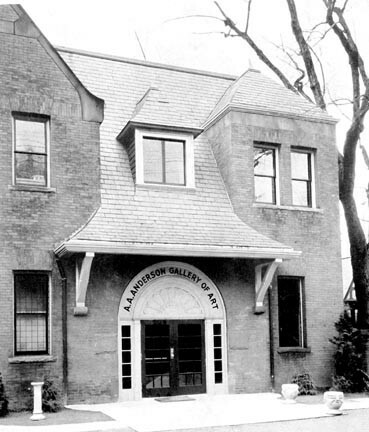 A stable behind the former Lewis Ginter house at 901 W. Franklin St. was converted for use as an art gallery soon after the property was purchased in 1930 by the Richmond division of the College of William and Mary, which became Richmond Professional Institute in 1939, the forerunner of VCU. 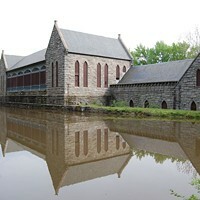 The adaptation was designed by architect Charles M. Robinson. The gallery was enlarged a number of times to house the school’s library. It was returned to gallery use in 1970. Marilyn Zeitlin followed Koplin as director. In addition to adding world-recognized artists such as John Baldessari and Komar and Melamid to the schedule, she sought to raise awareness of the Anderson to the wider community, establishing Friends of the Anderson Gallery for fundraising. The late gallery owner Beverley Reynolds was a founder of the group. One boy almost lost his life to the cause. In February 1983, the Friends staged a costume gala, “Tropical Madness,” transforming the gallery with Brazilian-themed décor. Patsy Pettus, a prominent Richmond arts patron, had placed a Carmen Miranda-inspired hat, with fresh fruit piled high, on her head and arrived with her son, Ted, a 15-year-old high-school student who was recovering from surgery. Amid the festivities, he leaned back into a table where there were votive candles. His poncho costume flared up, sending patrons scattering. Two guests from New York tackled the enflamed teenager and rolled him across floor. Disaster averted. If those who knew the Anderson hadn’t thought it before, it was now clear: The gallery, with its confusing layout and lack of elevator, wasn’t only inconvenient, it also might be unsafe. Other drawbacks were the inability to move large works above the first floor without an elevator. It was inexcusable that those with certain disabilities or in wheelchairs had no access to most of the building. Climate control was spotty. Some lenders and institutions, such as the Hirshhorn Museum in Washington, refused to lend works for some or all of those reasons. Parking was nonexistent and restrooms were challenged. Architects never figured how to add an elevator in so constricted a space. But modest fundraising continued. A succession of directors, Michael Walls, Steven High and Ted Potter, and loyal supporters such as Reynolds, held out hope that a new gallery was on the horizon — not an unreasonable expectation for a university with a nationally ranked art school. There were ideas. A Main Street site overlooking Monroe Park was considered. It would have involved repurposing a former storage warehouse but the plan was dropped when the School of Engineering was built there. Next, a more architecturally glamorous scheme was designed for a Cary Street site next to the university’s Brandcenter. That location and plan was inexplicably rejected, and it didn’t help that the prominent architect, Charles Gwathmey, died during the process. Finally, a lot at the busy intersection of Belvidere and Broad was chosen. But the new institution’s program veered in significantly different directions from the Anderson: It would neither collect artwork nor show a historical range of work. And undergraduate shows would be staged elsewhere. It will become the Institute for Contemporary Art. 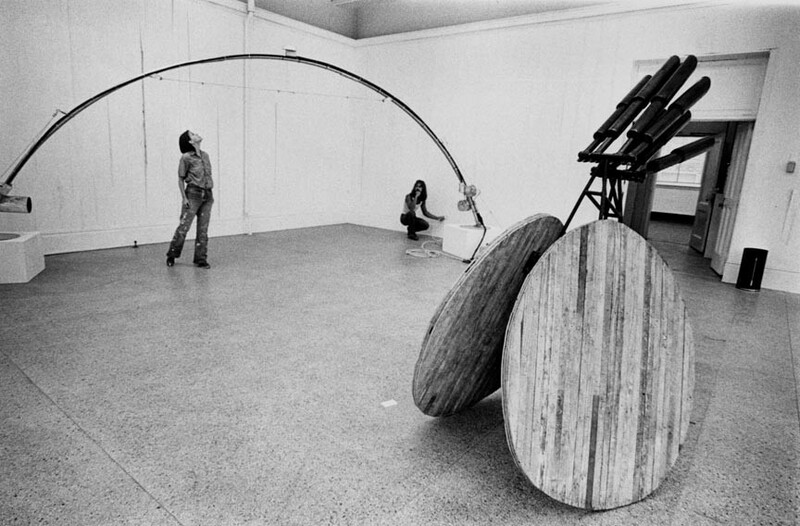 Students examine a sculpture in a School of the Arts show presented at the gallery during the early 1980s. Dean Seipel and Anderson director Kistler meet on a recent morning in his office in the art school’s Pollak Building. A large abstract expressionist painting by Judith Godwin, a long-established New York artist and VCU alumna, hangs nearby. They discuss a major book that’s being readied for fall publication to capture the long history of the Anderson Gallery.